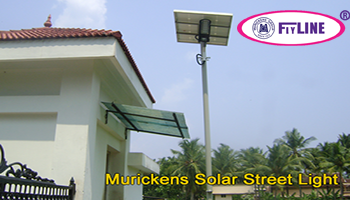 Murickens "Flyline Solar Street light System” is using solar energy received by solar panels to charge the battery 12 V or 24 V which can be used for streetlights, garden lights, advertising posters, houses etc. The main advantage of the Solar Street light System is that it is absolutely free from electricity bills and man power and also very useful where there is no power as it can even be used in deserts, oceans and places anywhere on earth where sunlight is available. The unit consists of Flyline LED lamp with charge control system, solar panel and battery and it can be used in any capacity as per your requirements . Solar cells convert the solar light into direct current and charge the battery for storage and the control system controls the whole system taking care of battery over charging cut off, deep discharging cut off, short circuit cut off, low battery cut off and it is specially designed to avoid any power loss and to get more back up time compared with the AC system. Light Emitting Diode (LED) has become a revolution in the field of Lights and it is even contemplated that In future all the bulbs and tubes and even CFL will be replaced by the LED as anyone can bluntly say that LED is a life long power saver as our product is manufactured as per MNRE specifications and ISO certified and the names of .our valued clients include International Airport, Karipoor, Kerala, The CISF 7th battalion military camp, Hyderabad, Govt. of India Dept. of Space, Sreeharikotta, Central Marine Fisheries Research Institute, Cochin, Kerala Agriculture Research University, Malappuram etc. The services of a well qualified and experienced technician is highly essential while installing to attain maximum results and to avoid unnecessary expenses and unpleasant outcomes. ► DC volt out put 12V or 24 V. ► German Technology assures the quality of flyline solar garden light. ► MNRE approved. ► ISO 9001- 2015 quality certified product.► Flyline solar luminary cabinet is weather proof so it is ideal for Streetlight, garden light, Gate light, and park light etc. ► It has automatic control system (Dusk to Dawn). ► It is available in 3w, 6w, 9w, 12w, 18w and above. ► Dimmer option after 6 hours.. ► By using powerful LED we get good brightness for the light.. ► Its power consumption is very low and get very good back up.. ► No need of wiring. ► With the cost of AC cable and wiring, you can install a Flyline full light system, with out electricity bill..► We can charge the battery with the help of solar cell.. ► Its Initial cost is also very low.. ► No further expense.. ► Very low maintenance. . ► Specially designed compact control system protect the whole unit..